The kitchen benchtop is a fundamental design feature in any kitchen and it’s possibly the most crucial decision you will make. Being the main focal point, the benchtop will heavily influence your decisions around the rest of your kitchen finishes so it’s a good place to start when selecting materials. The kitchen bench is often used as a dining table or entertainment area as well, so it may need to accommodate more than one practical use. Choosing the right surface is paramount. Depending on your individual needs, some options will be more suitable to you than others as each have their own unique advantages and disadvantages. Engineered Quartz (e.g. Caesarstone, Quantum Quartz, Silestone, Smart Stone) is a man-made composite of quartz (93-95%), resins & colour pigments (6-10%). These are crushed into a powder and combined, much like ingredients in a cake, then cured at high temperatures and polished to form smooth, non-porous slabs. 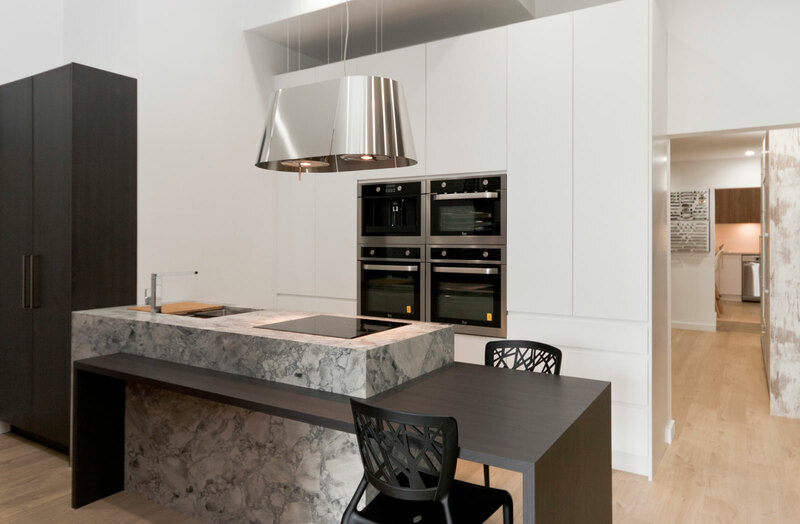 Engineered quartz is the standard go-to for kitchen benchtops. About 7 out of 10 customers will opt for engineered quartz as its non-porous nature is perfect for kitchens/food prep areas. Pros: Stain resistant, non-porous, safe for food prep, consistent colour, fairly low maintenance. Cons: Resins are not UV stable so may fade in direct sunlight, not suitable for outdoor use, cracks and scorches are non-repairable. Natural stone (e.g. marble, granite) is the least processed of all the different benchtop materials. Massive chunks of rock are taken from the earth, cut into slabs and polished, honed or brushed to create the desired finish, then it’s sealed and that’s about it. The two most popular types of natural stone used for kitchen benchtops are granite and marble. Granite Pros: The hardest of all stone types (8/10 mohs rating), less porous than other natural stone types, available in different thicknesses. Granite Cons: Colour options are limited and they tend to all have the same chunky fleck/textured look. Marble Pros: Looks absolutely gorgeous and is the most sought after type of natural stone. Marble Cons: One of the softest natural stone types (3-4/10 mohs rating), during manufacturing it’s susceptible to cracking along vein lines, more porous so it’s susceptible to staining and acid etching. Porcelain benchtops (e.g. Neolith, Dekton, Quantum Six) are an all natural product made from clays, feldspar, silica, mineral oxides and colour pigments. These ingredients are ground into a fine powder and then bonded together at super high temperatures to form extremely dense, non-porous slabs. Think of it like a really strong, almost indestructible tile in extra large size. 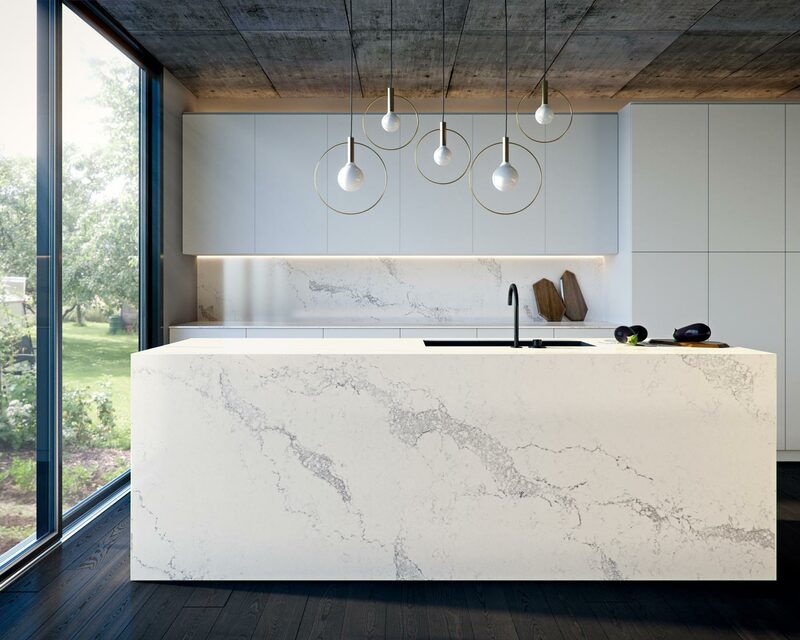 Available in a range of different colours & textures, porcelain benchtops can also have designs that are printed onto the surface that imitate materials such as concrete, marble & timber. Cons: more expensive & labour intensive to manufacture, limited colour range, can’t be repaired if damaged (although unlikely due to it’s strength). 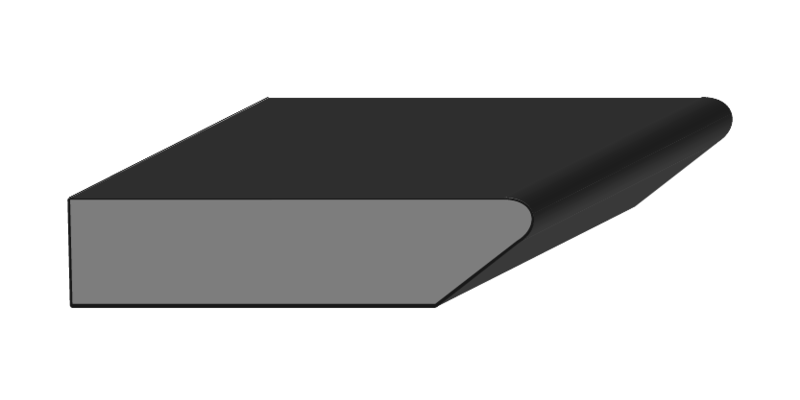 Acrylic benchtops (e.g. Corian) are made of acrylic resins… plastic, basically. But before you turn your nose up, here are a few things you may not know. Acrylic benchtops can be moulded and formed in one piece using heat, through a process called ‘thermoforming’. This means you can have a benchtop and a sink all in one piece with zero join lines. Same with splashbacks and waterfall edges as the benchtop can literally be bent into a 90 degree angle, removing the need for any joins, whatsoever. They are strong, easy to clean, extremely stain resistant and won’t crack or chip easily. Pros: No visible join lines, can be moulded into any shape and bent into corners, colour wont fade, extremely strong, won’t crack, scratches can be buffed out if neccessary. Cons: Softer material, scratches easily, limited plain/flat color range (no texture or detail). Timber has a unique and natural richness, full of character that’s unlike any other benchtop material. Where stone and porcelain/ceramic surfaces feel hard and cold to touch, natural timber is soft and has a warmth to it that some just prefer. Polyurethane / 2 pack – a hard wearing acrylic finish with excellent chemical and abrasion resistance. Natural oil finish – an organic look that’s economical, easy to apply and maintains the condition and character of the timber beautifully. Pros: Natural, unique product, can be stained in different colours, durable, resilient & practical. Dents, chips or scratches can be easily repaired. Cons: Requires more care and maintenance, needs to be resealed & repolished every so often, absorbs stains more easily than other surfaces, no antibacterial properties so not entirely food safe, not the easiest surface to keep clean. The word ‘laminate’ for most people evokes flashbacks of grandma’s old kitchen where the edges were peeling back, exposing what looked like swollen, furry pages from an overused phone book. Thankfully, laminates today are in a completely different league. The core board and the laminate material itself are of superior quality compared to predecessor versions so they’re more moisture resistant and far less likely to peel back. The lamination process now uses advanced machinery that can achieve a much tighter corner radius, for a squarer look edge profile. Plus, there are stacks of available colours, textures, finishes and prints – some that will have you guessing if it’s the real thing. Laminate benchtops are definitely worth considering and especially if your budget is tight. Pros: Extremely cost effective, cheap to replace if necessary, hard wearing, moisture resistant, heat resistant up to 190-240 degrees, plenty of colour options, available in different thicknesses, antimicrobial surface protection, warmer & softer to touch, less noisy & more forgiving when making contact with plates, glassware etc (compared to stone for example). Cons: Can’t use with undermount sinks, won’t last as long as other materials if not looked after, not ideal for really wet areas, susceptible to scratches and de-lamination on edges over time. Ever considered using two different benchtop materials? Think about how each space will be used and pick the most appropriate material for that area. e.g. engineered stone for food prep areas and timber or laminate for the section where you’ll be dining. Splashbacks come in a range of different options and price points. The most popular choice is to use the same material as the benchtop for a harmonious, elegant look that oozes high end. Although, depending on your benchtop material, it can add to the cost considerably so it’s not always feasible. If you’re not 100% sure, it’s best to leave this decision until after you’ve selected everything else. This way you’ll have a better idea of which product would best compliment the rest of the kitchen. Even on a tight budget your designer will be able to help you find something that suits your design without costing a fortune. Tiles have been around forever and still remain one of the most cost effective solutions for kitchen splashbacks for those where budget is the main priority. While some might argue that its a dated look, it really depends what tiles you’re using and how they are laid. There are some really beautiful tiles being produced today in many different shapes, sizes, colours and textures so it pays to do a bit of investigating before writing it off completely. Small subway tiles laid in a herringbone pattern can add a subtle, modern contrast to an otherwise boring kitchen. Or, you could do the opposite and lay jumbo tiles (60 x 60cm, 90 x 90cm) with a tight vertical grout line to achieve a glass look without the high price tag. Pros: Inexpensive compared to other options, plenty of colour choices available, easy to install. Glass splashbacks great for achieving a smooth, seamless finish and the colour options are practically endless. The glass sheets are painted on the back to achieve the desired colour, so you can basically choose any colour you like from a Dulux, Taubmans or other paint brand’s colour chart and away you go. Mirrored splashbacks are great for making small areas appear larger and can be used to bring the outdoors inside, e.g. kitchens facing a garden. Natural stone (e.g. marble, granite) is the least processed of all stone materials. Massive chunks of rock are taken from the earth, cut into slabs and polished, honed or brushed to create the desired finish, then it’s sealed and that’s about it. The two most popular types of natural stone used for kitchen splashbacks are granite and marble. Acrylic splashbacks (e.g. Corian) are made of acrylic resins….. plastic, basically. But before you turn your nose up, there’s are a few things you may not know about. Acrylic surfaces can be moulded and formed in one piece using heat, through a process called ‘thermoforming’. 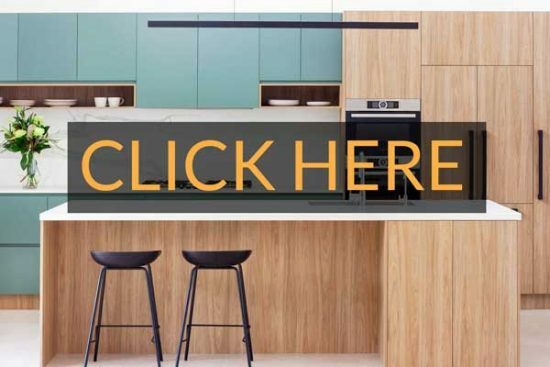 This means you can have a benchtop, splashback and a sink all in one piece with zero join lines. They are strong, easy to clean, extremely stain resistant and won’t crack or chip easily. There’s many different edge profiles you can choose for your stone benchtop however, the most popular is the pencil round (pictured below). 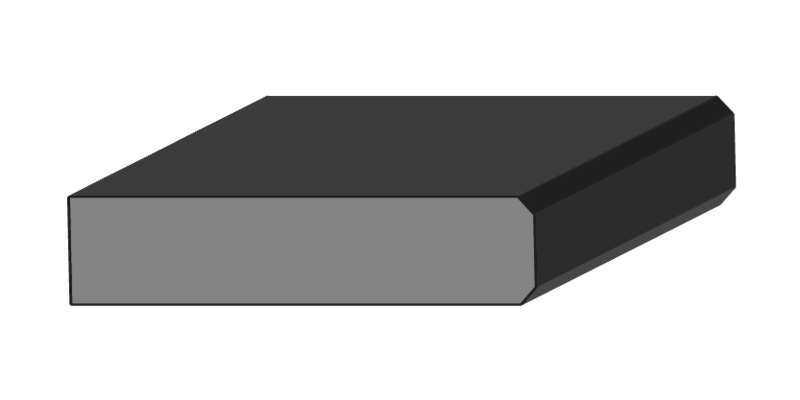 The pencil round is a square edge with rounded radius corners. It’s clean, simple & sits flush with the kitchen cabinets. It’s also the least expensive of all edge profiles. The standard thickness for a stone benchtop is 20mm but you can increase this in 20mm increments to whatever you like (e.g. 40mm, 60mm and up). Some stone brands have a limited colour range released in 30mm slabs so this may also an option. Which thickness is best for your kitchen design? It really comes down to personal preference and the style, mood or era you are trying to achieve. Your kitchen designer can help you select a profile and thickness to best suit your desired outcome. Generally, thin tops feel lighter and are more subtle in relationship to the rest of the design and thicker tops appear heavier and tend to dominate the space a bit more. Thicker tops usually work better in larger kitchens, where the piece has room to breathe and looks in proportion to the space. 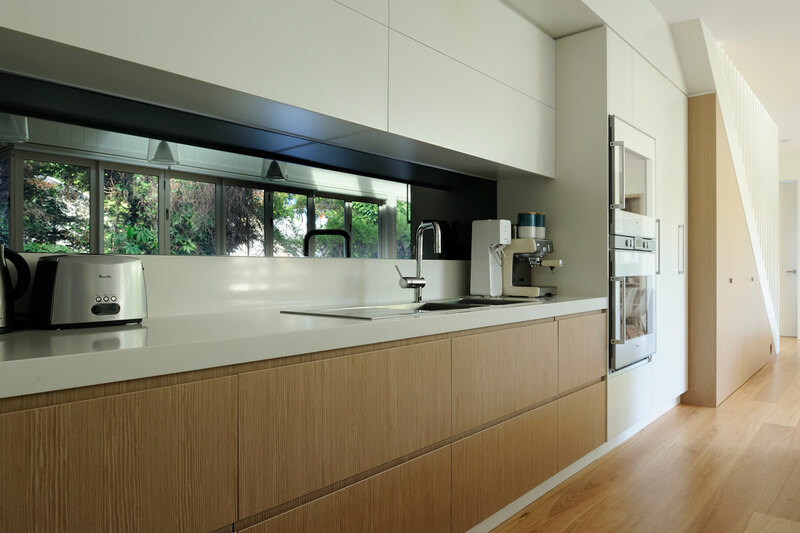 If your kitchen is particularly small, you might find a thinner benchtop more appropriate as it will feel less crowded. See below for examples of available edge profiles. 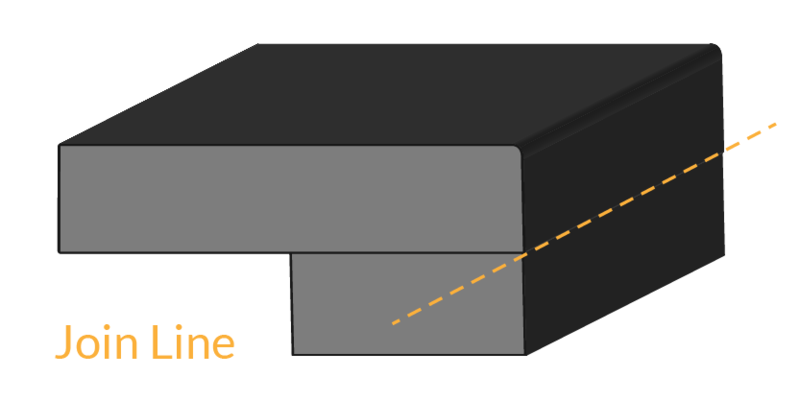 Edge Join – Mitred or Layered? Stone slabs already come in 20mm so if you’re having a 20mm benchtop you won’t need an edge join. All you will need to choose is the edge profile (see images below). 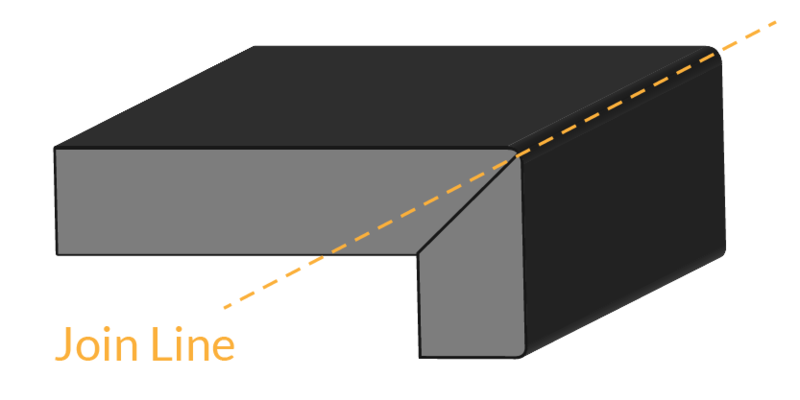 However, if you want your benchtop in 40mm or thicker, then you will need to choose how you’d like the edge join to be done, to create the thicker edge (see images below). 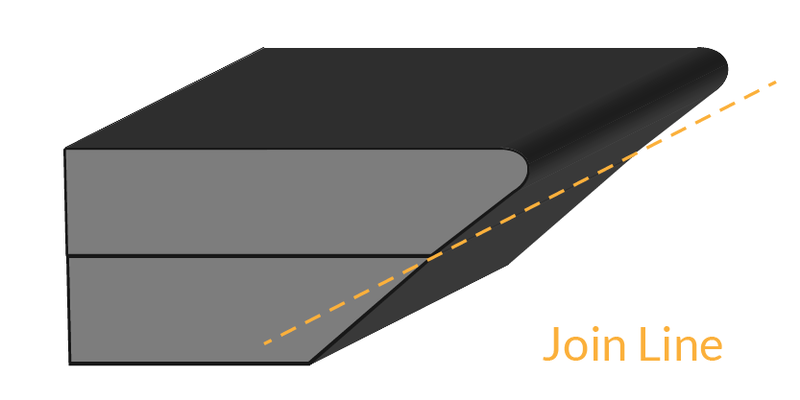 There are two types of joins to choose from – Mitred or Layered. A mitred edge join is where the stone pieces are cut on a 45 degree angle and joined through the actual corner (See images below). 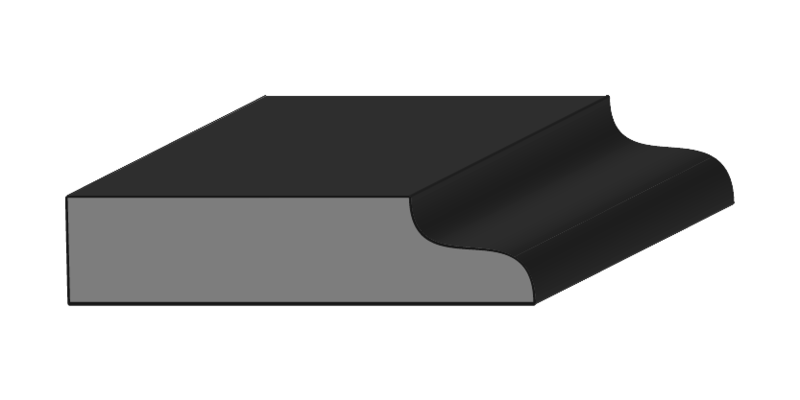 A mitred edge join is less noticeable than a laminated edge. It can be a little more prone to chipping but this is not a common problem with careful, regular use. 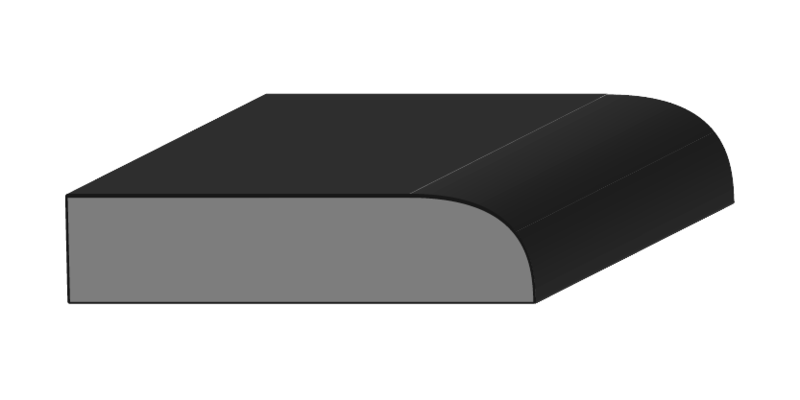 In most cases, a mitred join is an excellent choice, however it is more expensive than a layered edge. NOTE: Mitred joins are only available with a pencil round edge. All other edges in 40mm or thicker must be laminated. 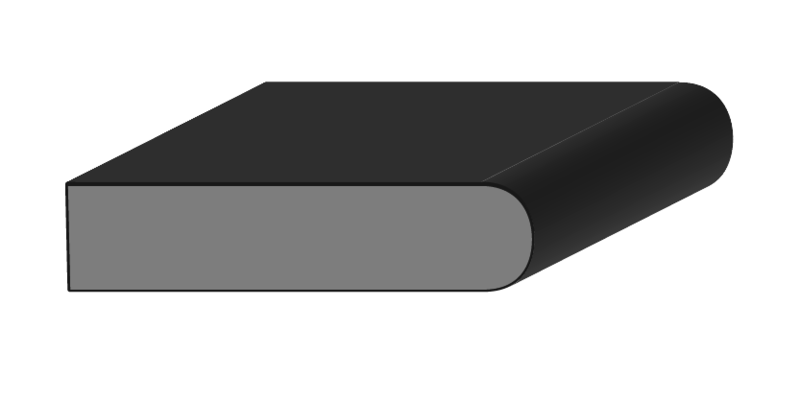 A layered edge join is where the two pieces of stone are stacked on top of one another and joined through the middle of the flat surface edge. This type of join is the least expensive of the two. It is also the safest / strongest structurally but is more visually noticeable than a mitred join. 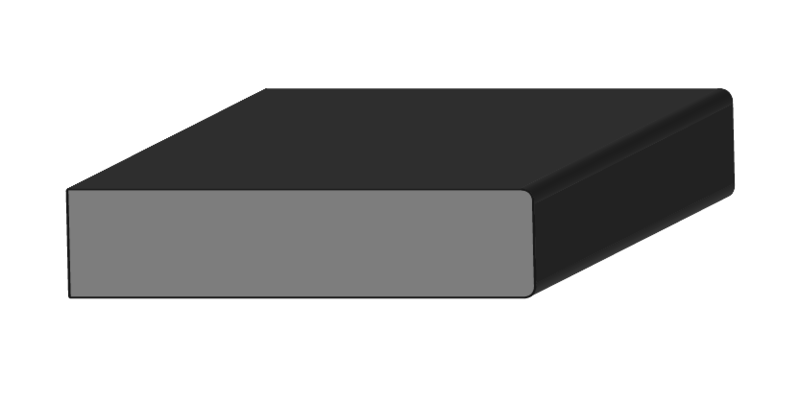 Depending on the size, layout and overhang area of your benchtop, this may be recommended for extra strength. NOTE: Layered joins are less noticeable on colours with finer details (e.g. fine stone flecks) and more noticeable on colours with larger detail (e.g. veining). Join lines in general tend to be less noticeable in lighter colours.